What has already not been said about the Fallkniven Tre Kronor series? This incredibly beautiful series of knives from the reputable Swedish manufacturer offers technological solutions which are highly advanced combined with design that is authentic and Swedish up to the veritable hilt. The development of the Tre Kronor blade is something which has taken a long time and the painstaking process has managed to offer a knife with a laminated blade that comes in 3G steel but which is also laminated in powder or sintered steel. And if that is not enough for a reputable blade, Fallkniven have also added a resilient and anticorrosive steel for the TK1 which provides stability for the hard centre. The result is a blade of exceptionally strong material which is also rigid and which retains an inimitable edge. The Tre Kronor knives are true examples of the Swedish minimalist idiom where one can find a real marriage of form and function. The end result is an implement with a unique edge and which offers the user a very easy and highly accommodating knife, you could call the TK1 a real world beater from the land of Sweden! So if you really want to treat yourself to an incredibly beautiful and technically sound knife, then the TK1 is really the best choice for you since it is probably unique. The laminated powdered steel offers inimitable strength with an edge that has never been previously used on the international market. Each knife is handmade and manually produced by extremely skilled knife makers who uphold a thousand year tradition and ensures that the TK1 is really unique. You wouldn’t want to present such a knife shoddily so the TK1 comes in an exclusive gift box for added allure. The TK1 is quite long at 8.4 inches with a blade length of 4 inches or 100mm. The blade thickness is 4.5mm ensuring strength and top class performance. It is a bit on the heavy side at 187 grammes with the nominal 3G steel and a hardness of 62HRC. 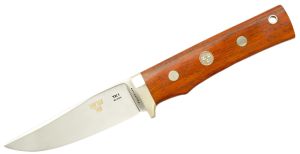 The stylish Cocobolo handle adds to the allure of the whole product. The full covering black leather sheath is also very attractive.